This entry was posted in MASSACRE CHURCH, Massacre church, post MARIA repairs on November 29, 2018 by Bernard Lauwyck. 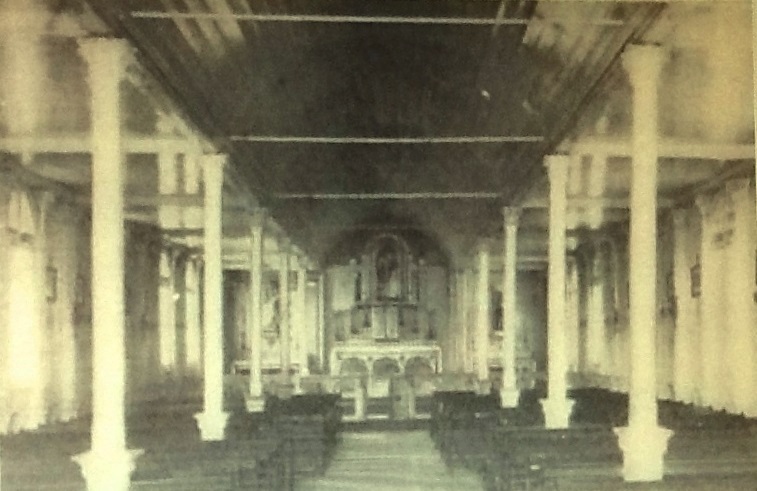 When the Belgian Redemptorists took over the Parish of St. Paul and St. Ann in 1912, the church at Massacre was in a dilapidated condition and too small for the growing population. Fr. Cyril Bossuyt C.Ss.R. , who was appointed parish priest early in 1914, decided that the parish needed a new church. This would be the third church on the same location; a portion of land given by the owner of the “Les Pointes” estate. Despite failing in health Fr. 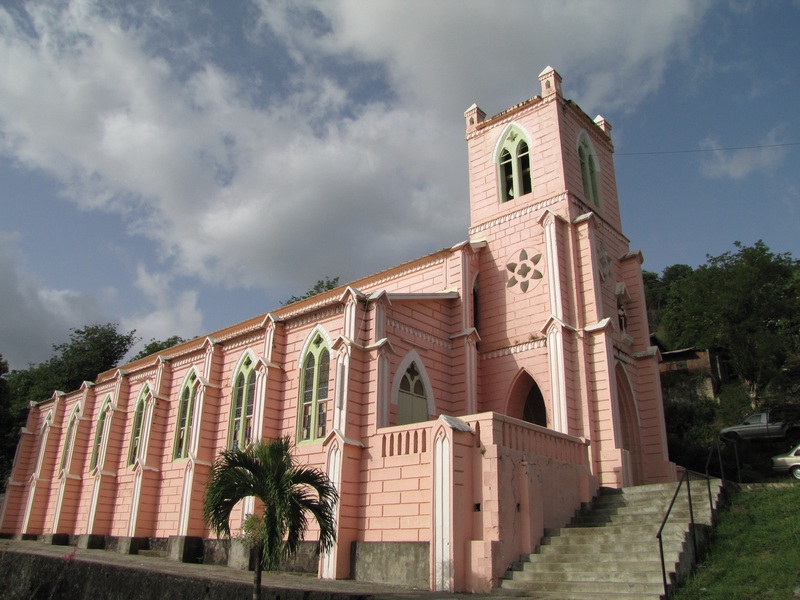 Sivienne managed , with the help of the parishioners, to complete a new church by mid 1885. This second church was solemnly blessed by Bishop Naughten . I found a photograph of this church in a publication named “LES MISSIONS CATHOLIQUES FRANÇAISES AU XIXE SIÈCLE ”. Fr. Bossuyt wanted to build a place of worship worthy of the Divine Occupant of the Tabernacle and he enlisted the help of his confrere to design a beautiful edifice. The talented Fr. Cuvelier C.Ss.R, came for that purpose from St. Croix and can be considered the architect of the present day Massacre church. He designed it in the neo-gothic style. This style invokes the great Gothic cathedrals built in Europe in the Middle Ages. For many people this is still the preferred style for a catholic place of worship. The demolition of the old church and the preparation of the grounds started sometime in 1916. It took a full six months to blast the rocks in order to create a plateau to accommodate a larger church 125 feet long and 55 feet wide . Early in 1917 the corner stone of the new church was blessed, and less than two years later the new church was solemnly blessed by Bishop Philip Schelfhaut, on Sunday December 1, 1918. Next, the church tower was constructed and solemnly blessed on the Feast of St. Ann, the patroness of the Parish, on July 26, 1921. A memorial slab in the slab reads : ST. PAUL AND ST ANN’S CHURCH A.D. 1918-1921. Fr. Bossuyt’s completed his work by installing beautiful stained-glass windows in 1922 and importing a church bell in 1936. The inscription on the bell, still in use today, reads : “ NOMINOR JOSEPHUM + C. BOSSUYT MAHAUT DOMINICA ”. There is also a smaller bell with the following inscription : “PIERRE JOLLY ESQR. 1820”. The church was damaged by a hurricane in 1930 . Bishop Moris reported that most galvanised roofing sheets were torn off. It also fared badly during the passage of hurricane David in 1979. In 1987 Fr. Franklyn Cuffy C.Ss.R. embarked on the renovation of the roof. The contractor was Bertrand Bruno from Massacre. Fr. Cuffy also ordered the coloured glass to repair the stained glass windows. His successor, Fr. Clement Jolly C.Ss.R renovated 14 stained glass windows. The artisan was Bernard Clerici from France who spend several months in Dominica to do the work. In 2003 Fr Rodney Olive C.Ss.R. consulted Mrs Nancy Nassief about a new colour scheme for the exterior and interior of the church. In addition to the painting works, he instructed my team to design and install a new screen and stand for the tabernacle, create a new ambo and a cover for the baptismal font. With left over coloured glass from 1987, pivoted windows were fabricated and installed. Fr. Rodney’s enhancement works ended in 2004 with the installation of tiles on the floors. “ What used to strike one before, on entering the church, was the height of its graceful pillars and the elegance of its pointed arches, which raised one’s mind and heart almost naturally to heavenly thoughts. Now that the church has been beautifully painted and decorated, the architectural lines being more in relief, the effect is simply marvellous. Indeed this is a church worthwhile visiting and worshipping in. This entry was posted in MASSACRE CHURCH, Massacre church, OLD CHURCHES and CHAPELS, RENOVATED CHURCHES and tagged Massacre church, St Paul church in Massacre, St. Ann's church in massacre on January 22, 2015 by Bernard Lauwyck.